ahh that is soo cool! 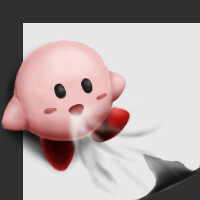 lol you drew Kirby great and lol thats awsome how he is like peeling up the applet. Creativity and aristically nice. is he trying to blow the page away? anyways, i like how u made kirby 3D. Lol, that's really funny! Nice usage of the background color to make kirby all stands out. ooo! That is so adorable!! ^_^ awww, I just want to squeeze all the air out of him. Ha! Even the elite Mod admits to Kirby week! >_<;;;;; Yeah... Great draw... Kirby rawks. woo! kirby looks all claymation-ish! this is soo kyute! lol, this is really cool. I like the effect. Nice job. that's so cool. i love the 3D style. *claps* very good job. Oh so cute!! Kirby wants 2Draw!!! He´s got a cute expression. IT´S KIRBY WEEK!